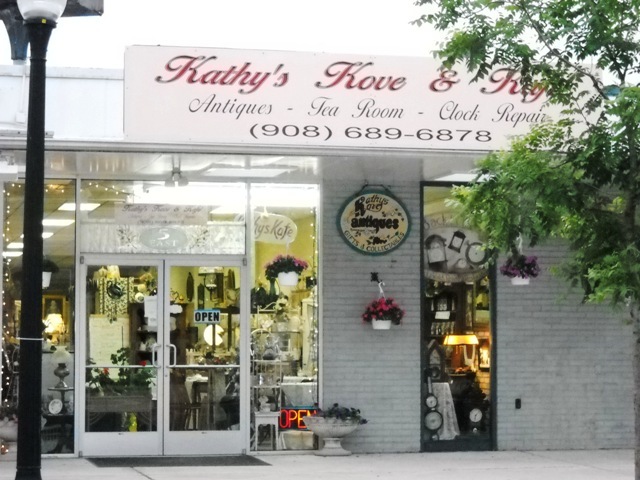 Kathy's Kove & Kafe' is an eclectic multi dealer antiques shop offering clock repair and a unique tearoom - and then some! This is our on-line shopping website store, offering a great mix of contemporary home decor - Stained Glass Panels, Stained Glass Windows, Stained Glass Lamps (both Tiffany Lamp and window styles and Mission lamp and window styles), garden accessories (beautiful garden fountains, garden statuary and bird houses) and gifts (Kathy's Kafe' Tearoom Gifts), hostess gifts, chess sets, swords, telescopes and the like). A sampling of Kathy's Kove antiques (Roseville, Yelloware, Crockery, Pottery, antique and vintage lighting) and antique furniture such as oak china cabinets, oak tables, oak chests, mahogany china cabinets, mahogany tables, antique mirrors and other antique and vintage home decor and accessories. Kathy's Kove Antiques - a group shop, offering an eclectic mix of antique and vintage oak furniture, antique mahogany furniture, antique walnut furniture, antique and vintage maple furniture, china, depression glass, elegant glassware, Art Glass, Victorian and early 20th century crystal, yelloware and Roseville pottery among others, sterling silver candlesticks and candelabras, sterling serving pieces, antique mechanical clocks, antique lamps, antique and vintage linens, collectibles and more. A warm, cozy tearoom and gift shop offering a full luncheon menu featuring home made soups, quiches, creative salads, specialty gourmet sandwiches, chicken pot pie, spinach pie - to name a few - and don't miss our delectible desserts from Italy. High Tea and Tea Service is served from 12:30pm to 5pm - reservations required. The gift shop offers loose tea, packaged tea, teapot warmers, teapots, tea/coffee presses, hostess gifts, Tea Accessories, gifts, contemporary luncheon sets and more. Back In Time Clock Repair - we repair all clocks, antique mechanical clocks to newer quartz clocks. We offer grandfather clock set ups in your home as well as overhauls and repair. All repair work is guaranteed. Kathy's Kove Art Gallery- Opened in November, 2012, Kathy's Kove Art Gallery is a permanent home to a number of talented artists who offer their works for sale. The gallery houses these : Anne Freeman - Photographic Topography - High Bridge, NJ, China Romero - Oil Painter - Washington, NJ, Gerry Vitiello - Photographic Artist - Washington, NJ, Ann Reeves, Folk Artist - Belvidere, NJ, Loretta Luglio, New Hope, PA. We are looking for additional artists who would like a home for their works. Rent is reasonable and there is no commission or floor time required. Please inquire at: kathy@kathyskove.com. We strive to offer a wide selection of antiques, collectibles, art and gifts, lovingly displayed for your shopping pleasure. We love to help our customers shop for that special piece of furniture, accessory or gift. We truly welcome you to our shop and our little world! Our store is open Wednesday through Sunday from 11:30am to 6pm or later. We'd love for you to visit us. You're sure to find that special something among our extensive collections! We are always interested in buying or consigning quality antiques of all sorts. Located in Washington Borough, a quaint little historic town in northwest New Jersey. We are convenient to Routes 80, 78, 31, 57 and 46.